Use of the Internet among consumers in the homebuying process continues to grow, but those buyers are more, not less, likely to use a real estate agent, according to an annual survey from the National Association of Realtors. NAR’s 2013 Profile of Home Buyers and Sellers includes survey responses from 8,767 people who purchased a home between July 2012 and June 2013. The seller information in the report is from those buyers who also sold a home. For those who purchased a home during that time period, the highest share ever — 92 percent — used the Internet to search for a home, up from 90 percent in last year’s survey and 71 percent in 2003. Just over 4 in 10 buyers (42 percent) started the homebuying process by looking for properties online (up from 35 percent in 2011) followed distantly by those whose first step was to contact a real estate agent (17 percent). 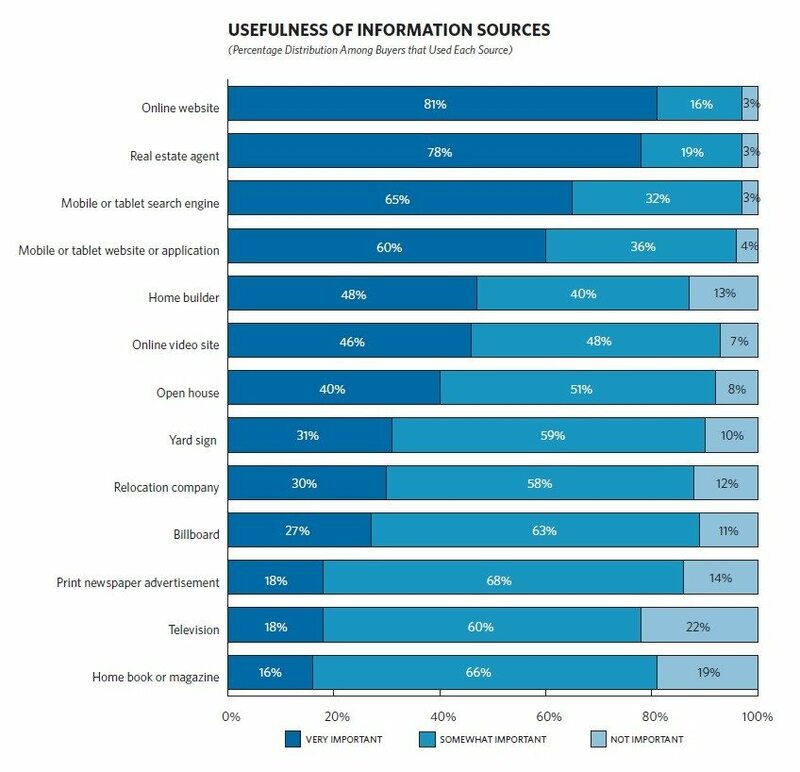 Online websites and agents tied as the most common information sources homebuyers used in their search with 89 percent using each. Yard signs followed at 51 percent. Last year’s survey found that homebuyers were more likely to use multiple listing service websites when searching for homes than any other source of online information, including third-party listing sites and mobile apps. 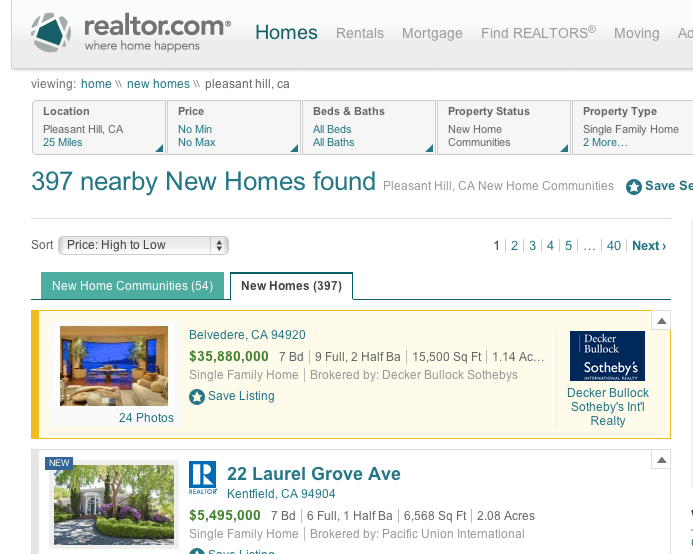 That finding, along with a claim that buyers used realtor.com more often than unspecified “other websites with real estate listings,” was met with some skepticism. While consumers on last year’s survey could check “Other websites with real estate listings (e.g., Google and Yahoo),” the survey did not offer Zillow and Trulia — the most visited real estate search portals, according to third-party monitoring data — as choices. At least one Inman News reader commented that the wording of the question, and the choice of answers provided, was likely to skew the results. This year’s profile does not break down the types of online websites used by homebuyers in the home search process. “[I]t’s fairly normal to drop some questions from the survey when new ones are added to track market developments. With growth to nearly 1 million real estate sites online, including individual agent sites operated by two-thirds of NAR members, consumers typically go to multiple sites,” NAR spokesman Walt Molony told Inman News. Regardless of the specific source, an ever-increasing share of buyers found the home they purchased online: 43 percent this year, compared with 8 percent in 2001. The share of buyers that found their home through an agent has been dropping since 2010 when it stood at 38 percent, and clocked in at 33 percent this year. In 2001, 48 percent of buyers found their home through an agent. Among those who used mobile search (45 percent), 22 percent found their home with a mobile app. Only 4 percent found their agent with a mobile app. Among those who searched for homes online, three-quarters later drove by or viewed a home and 63 percent walked through a home they saw online. Thirty percent of buyers found the agent they used to search for or buy a home online and one-quarter requested more information online. 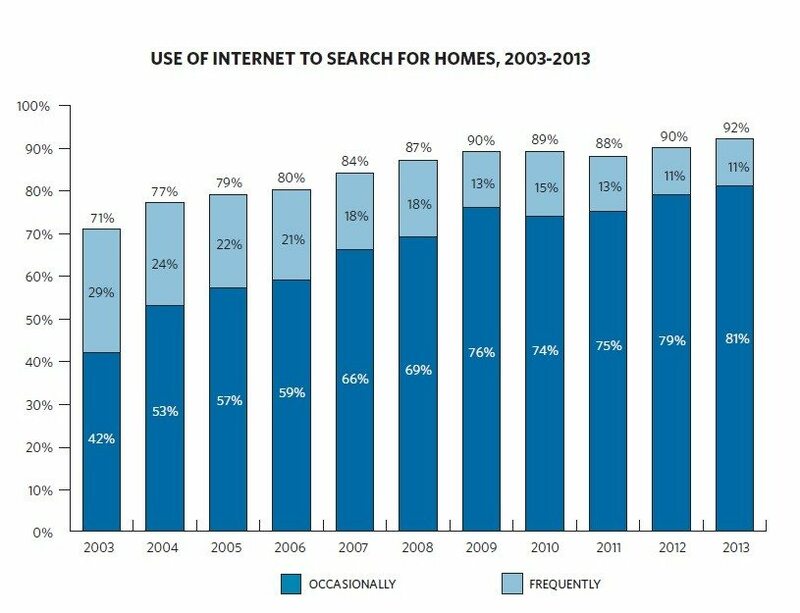 The typical buyer who used the Internet in their home search is 41 years old and had a median 2012 household income of $84,500 compared with 61 years old and a median income of $66,000 for the typical buyer who did not use the Internet to search for a home. The typical buyer who used the Internet to search had triple the search time length than the typical non-Internet searcher, perhaps suggesting non-Internet users know the home they would like to buy or have a specific area in which they target their search, the report said. Among buyer respondents overall, 88 percent purchased their home through a real estate agent, but among those who used the Internet to search for homes that share goes up to 90 percent. Only 69 percent of those who did not use the Internet to search bought through an agent. “While the vast majority of buyers use the Internet during the homebuying process, the Internet does not replace the real estate agent in the transaction. In fact, buyers who used the Internet were more likely than those who did not use the Internet to purchase their home through an agent,” the report said. 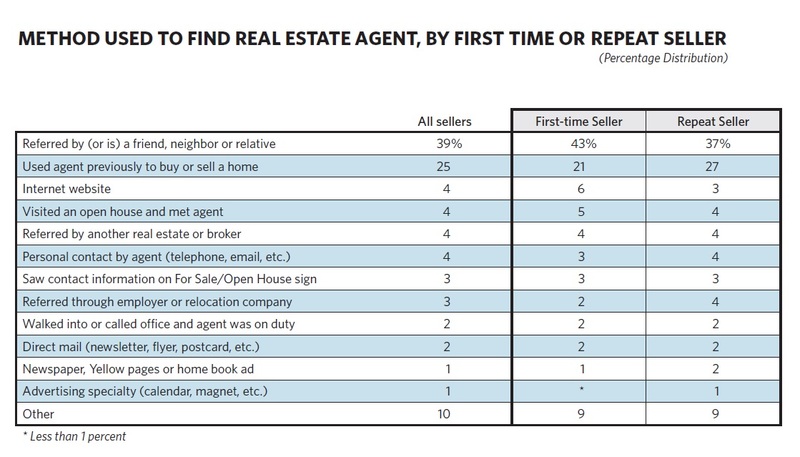 Among both buyers and sellers, the most common way they found their real estate agent was through a referral from a friend, neighbor or family member: 42 percent and 39 percent, respectively. Among sellers, a quarter used an agent they had used previously to buy or sell a home. For buyers, that percentage was cut in half: 12 percent. Buyers were twice as likely to find their agent through an online website: 9 percent, compared with 4 percent for sellers. Among the skills buyer respondents valued in a real estate agent, the most valued skills were honesty and integrity; knowledge of the purchase process; responsiveness; knowledge of the real estate market; and negotiation skills. More than 86 percent of buyers said those skills were “very important.” By contrast, only 46 percent said “skills with technology” were very important. Buyers were most likely to cite helping them find the right property as the service they most wanted from real estate agents (53 percent), followed by help negotiating terms of sale (12 percent), help with price negotiations (11 percent), help identifying comparable properties (8 percent), and help with paperwork (7 percent). Only a few (3 percent) identified advice on how much home they could afford as a most-wanted service, or helping arrange financing (3 percent) or providing information about a neighborhood (1 percent). The median 2012 income of all homebuyers was $83,300, up 6 percent from 2011, and the average age 42, unchanged from the previous year. Eighty percent purchased detached, single-family homes. 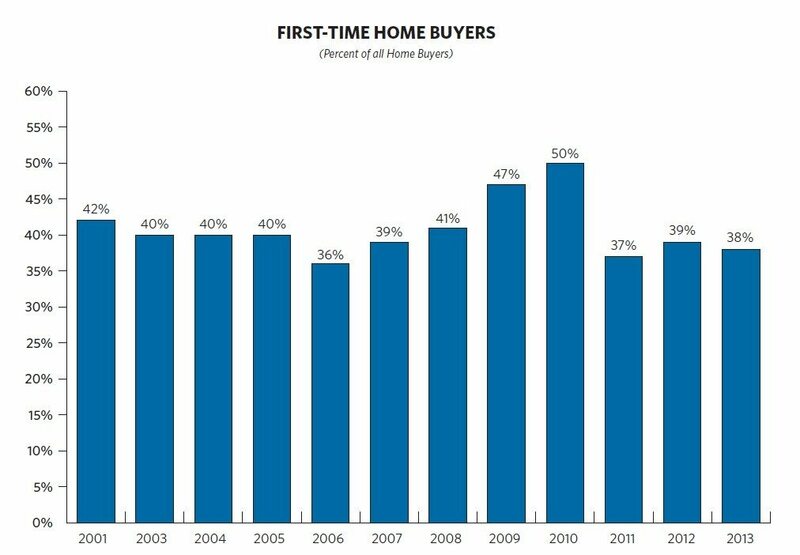 First-time homebuyers represented 38 percent of buyers, down 1 percentage point from last year’s survey. With a median age of 31 and median income of $67,400 (up 9 percent from last year), first-timers bought homes at a median price of $170,000 (up 10 percent from last year). Repeat buyers, in contrast, had a median age of 52 and median income of $96,000 (up 3 percent from last year) and purchased homes with a median price of $240,000, up 9 percent from last year. First-time homebuyers placed a median down payment of 5 percent down on their homes, compared with 14 percent for repeat buyers. Of those entry-level buyers who financed, 78 percent tapped into savings; 27 percent used a gift from a friend or relative, most often parents; 9 percent sold stocks or bonds; 8 percent used 401(k) funds; and 7 percent received a loan from a friend or relative. Neighborhood quality was the No. 1 factor for neighborhood choice by buyers (63 percent), followed by commute-to-work convenience (48 percent), affordability of homes (40 percent), and proximity to family and friends (38 percent). The median age for home sellers was 53 with an income of $97,500, up from $95,400 last year. Their homes were on the market for an average of five weeks, down from 11 weeks last year. Only 9 percent of sellers said they sold their home without the assistance of an agent (“for sale by owner,” or FSBO), down from 14 percent in 2003. And 40 percent of FSBO sales were to buyers who were previously known to the seller. FSBO sellers used yard signs (36 percent), and marketed to friends, relatives and neighbors (28 percent), but they also used online classified advertisements (16 percent), open houses (14 percent), for-sale-by-owner websites (13 percent), and third-party aggregators (11 percent). Four percent said they used realtor.com. Among sellers who used an agent, 85 percent said their agent listed their home on an MLS website; 66 percent used a yard sign; 51 percent held an open house; 50 percent listed their home on an agent website; 45 percent listed the home on a company website; 42 percent listed it on realtor.com; 27 percent listed it on a third-party website; 15 percent used a print newspaper advertisement; and 9 percent used video. Only 6 percent said their home was featured on social networking sites like Facebook and Twitter. Eight in 10 sellers said their agent provided a full set of services, while 10 percent said they hired an agent to place their home in the MLS and perform few if any additional services. Another 9 percent hired an agent to perform a limited set of services. The share of married couple buyers rose to its highest level since 2001 to 66 percent. A quarter of all buyers were single, unchanged from last year. Nonetheless, NAR indicated that tight lending conditions are impacting buying activity among singles and first-time buyers. “Single homebuyers have been suppressed for the past three years by restrictive mortgage lending standards, which favor dual-income households who are more likely to have higher credit scores,” said Lawrence Yun, NAR’s chief economist, in a statement. For the first time, NAR included a survey question on multigenerational households, which comprised 14 percent of respondents. Does James Packer think Zillow will disintermediate real estate agents?